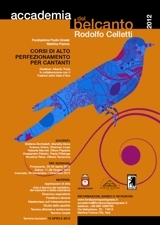 The “Rodolfo Celletti” Belcanto Academy in Martina Franca, sponsored and organized by Paolo Grassi Foundation with the collaboration of the Festival della Valle d’Itria, was set up in 2010 to provide a highly specific training on the various aspects of vocal technique and interpretation in the field of the Italian belcanto repertoire (from Monteverdi to Protoromanticism) to young lyrical singers, including the analysis and practice of the various styles of the tradition of Western musical theatre. Performance practice workshops, mostly applied to technique and style of the “recitar cantando” (acting while singing) from the 17th-century, of the Apulian and Neapolitan tradition, Rossini’s coloratura and belcanto repertoire of the early eighteenth century in Italy, will enrich the curriculum with on-site experiences, by guidance of coaches, directors and conductors of reference. •	a third study session from 8 to 18 November, 2012. The course includes the following subjects: Style applications: from Lied to the vocality in the contemporary music; Technical and vocal in-depth study; Art and technique of recitative; Art and technique of Baroque singing; Art and technique of coloratura; Phonetics and diction; Study of sheet music; Body training; Acting and performing technique; Awareness of breathing dynamics; Culture of the profession of the operatic singer; Workshop: singing, performing practice, study of sheet music, acting; Interpretation (Masterclass); Rossini and the Belcanto style (Masterclass). This is a closed number course so admission is subject to selection procedures. The class will be composed by 25 active students (maximum). Applications for selection must be sent by 15 April 2012, provided with a full-length photograph and an academic and professional CV. Applicants should not be older than 32 year old (for women) and 35 years old (for men) by 15 April 2012. •	€ 150,00 (one hundred and fifty/00) for the 3rd session (November 2012). •	€ 80,00 (eighty/00) for the 3rd session (November 2012). The theoretical-technical lessons will take place mainly in the Fondazione “Paolo Grassi” in Martina Franca (Via Metastasio, 20); the work experience activities will take place, apart from the above-mentioned location, in the areas dedicated to the Festival della Valle d’Itria. The Direction of the Academy and Fondazione Paolo Grassi staff are entitled to give support for accommodation at special low rates.